You have a lot to worry about when taking your pet on an airplane. 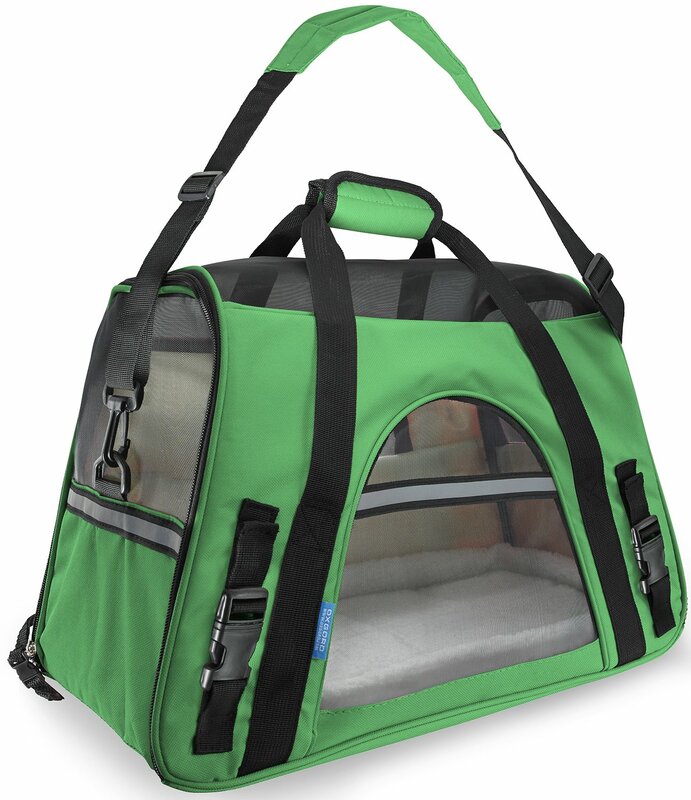 The carrier that your pet will spend the entire flight inside is definitely have to be ready. Having the right carrier definitely makes a huge distinction for your dog. The right carrier will calm their nerves. The wrong carrier can make them more anxious. There are hundreds of different options available for flying though and not all of them are great. This article will point you in the right direction of carriers that just work. We’ll also give you our top picks to make your dog as comfortable as possible. You must have an approved carrier for your dog to fly on a commercial flight. The manufacturers cooperate with a carriers to meet all the requirements. Carriers come in two varieties. Hard carriers and soft carriers. We’ll review both of them in this article. Hard carriers offer more protection from exterior objects. 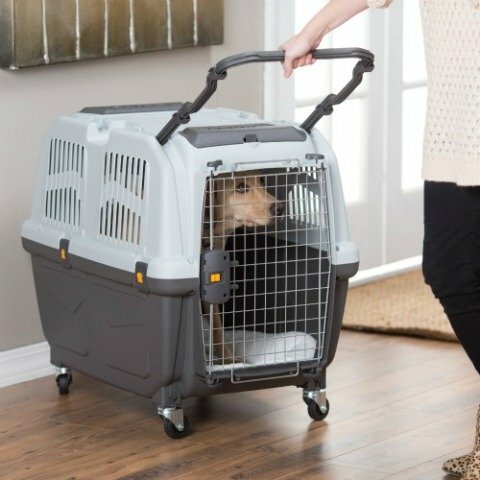 Basically, you don’t have to worry about your dog getting squished while in the carrier. There is also a much larger of hard carriers on the market. If your canine will need to travel as cargo, then purchasing a hard carrier is the best option. In fact, many airlines require a hard crate if your dog must go in the cargo hold for safety reasons. This makes it the only option if you have a large dog. There also aren’t that many large soft carriers on the market. They’re mostly for small dogs. A soft crate works best for smaller dogs that can go in the cabin with you. These crates are much more comfortable and are usually lighter. Maneuvering a soft crate around the tight quarters in an airplane cabin is also much easier. Definitely purchase a soft crate if you have a dog small enough to go in the cabin. 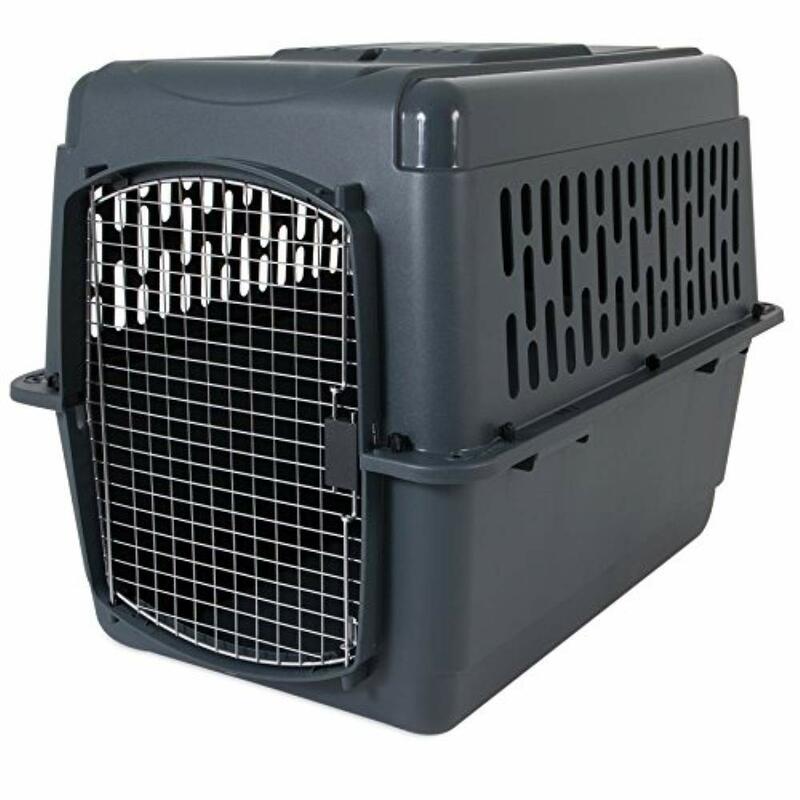 For a great hard crate we recommend the Petmate Sky Kennel. We like the amount of available accessories and customization options available. This makes meeting your specific travel needs extremely easy. The price is slightly higher than the other options, but the unique features more than make up for the few extra dollars you’ll be spending. Among the soft crates, the Pettall Stable Carrier is the best option and our recommended choice. The extra room and ventilation offered by its side compartment makes it super comfortable. It’s also extremely easy to carry, which is something that you want in a soft crate. We’ve carefully selected seven different crates that are all approved for air travel. For those of you that simply want the best, our top rated soft crate and top rated hard crate are also located in the sidebar. 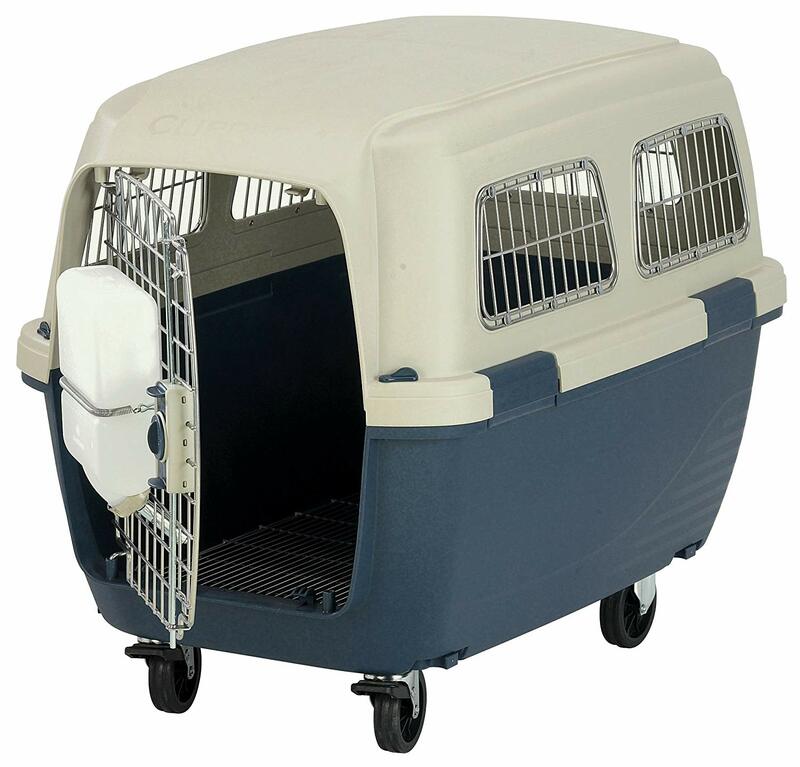 The Petmate Sky Kennel — awesome hard carrier for travel by plane. It comes in six sizes and is good enough for dogs weighing about 125 lbs. We like the secure, also easy openning, it allows for easy access when you need to feed your dog on a prolonged flight. We like this crate, but it is a somewhat bare bones option. You will need to provide your own bedding in order to comply with regulations. The only frill here is that it comes with a pair of clip on doggie bowls. This is actually an important add-on since it makes it easy for your dog to eat and drink while in the crate. Finally, it’s the cheapest hard crate on our list, which means more savings for you. If you need a practical option, then you’ll be pleased with the Petmate Sky Kennel. 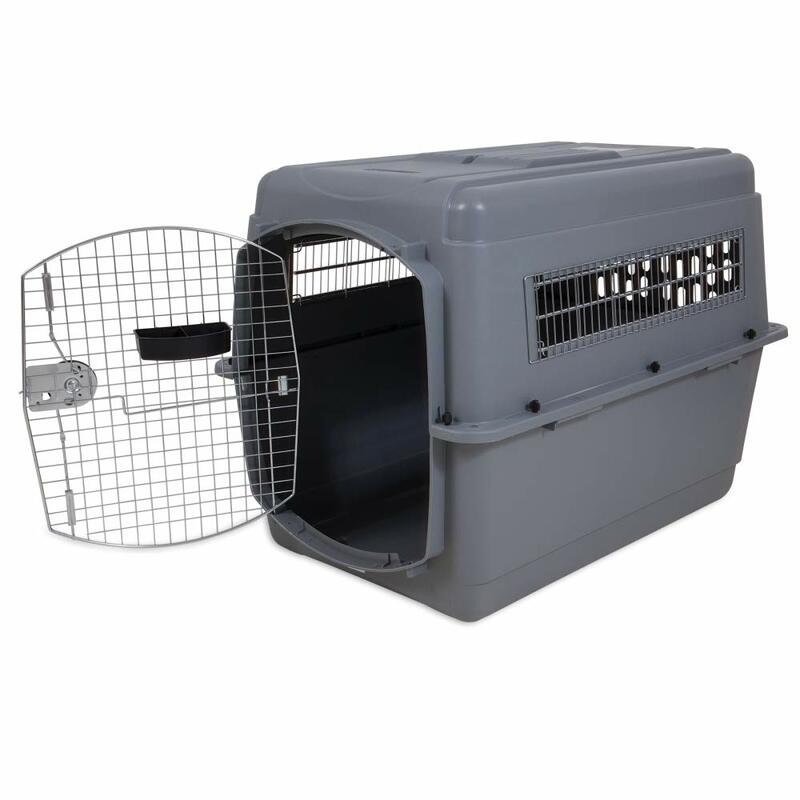 The Aspenport Pet Porter Kennel is another great hard crate option. It is a bit pricier than the Sky Kennel though. It’s still an excellent choice to keep your dog safe on a flight. It comes with a few different color options, which we really like since hard crates tend to have one available color. It’s certainly not a designer crate, but the color option available make it easier to identify than a normal and bland crate. The sizing options are excellent too. It can hold a dog up to 125 pounds. More importantly, you have eight available sizes. The smallest is designed for a dog under 10 pounds. This makes finding a size for all but the largest breed a simple task. We don’t like that you will need to supply your own food and water dishes though. Some air regulations state that you must use metal nuts on a dog carrier and this crate has plastic nuts. If you have to follow airline regulations, then you can easily switch out the nuts yourself. This is a great choice for air travel even with the potential regulatory problem. This is the most expensive crate featured on our list. The best feature of this crate, apart from the attractive two-tone aesthetic, is that you can add a wide range of accessories to make it more comfortable for your dog and easier for you to use. Some of these accessories include wheels, water bottles, and even no-spill cups. It is also the most secure dog crate that we have found. The “side-clackers” to hold the crate together and extra pins on the door both keep your dog safe and secure in their durable plastic container. The spring-latch is also very secure while still being easy to open for those of use with opposable thumbs thumbs. These security features are the perfect combination of ease of use and enhanced security for a pet carrier. It comes in five different sizes and the under portion can be ordered in two different colors, making for a highly customizable, airline-approved option for your travels. This crate does cost a slight bit more than some other options. However, the extra security is certainly worth the price for those of you especially concerned with keeping your pet secure during the flight. 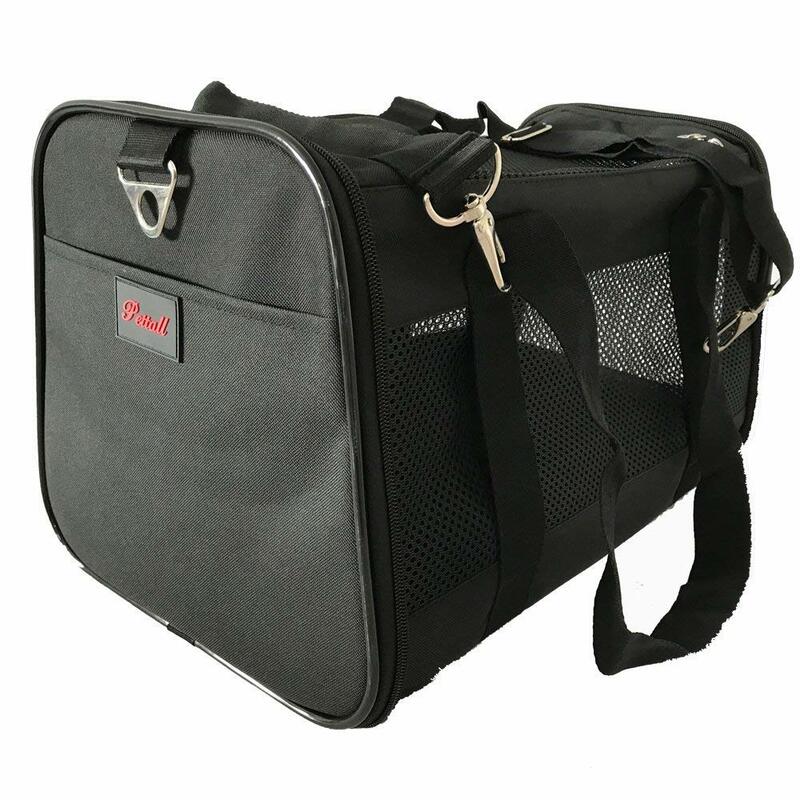 The Frontpet Expandable Carrier does exactly what the name describes. The extra flap on the side allows for extra space for your dog. It comes in an attractive black and red color combination. The expandable section is made of mesh, which will ensure your dog stays well ventilated. It also has an internal wire frame that prevents sagging and makes the whole carrier much more stable. This keeps your pet calm since it prevents their home from collapsing on them. You really do not want to further stress your dog during an already stressful flight. 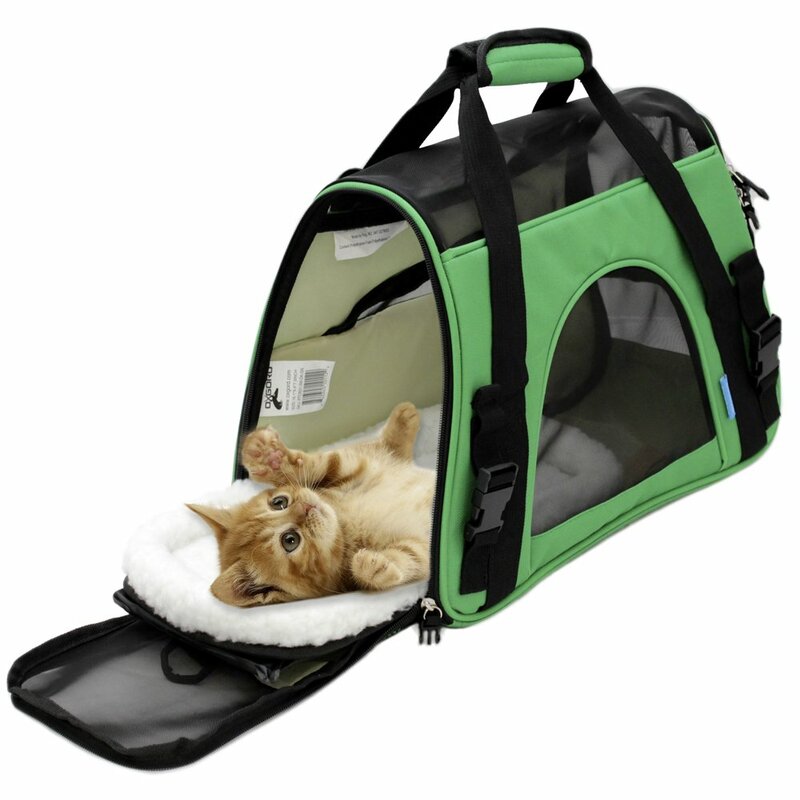 All the extra room makes this carrier a great option for older pets since it allows them to stretch out any stiff joins they may have. The only real drawback is that this carrier only comes in one slightly small size. This small size is only really suitable for animals around thirteen pounds. Overall, if your pet is small enough to fit in this, then you really cannot go wrong with this choice. 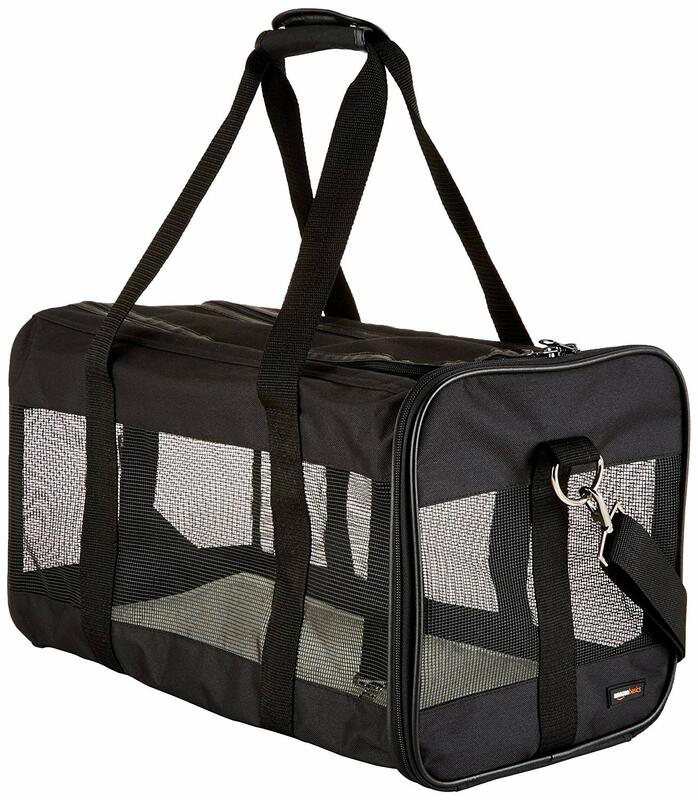 Another great option for those carrying a pet in the cabin is the OxGord carrier. We really like the absorbent fleece liner included with the carrier. 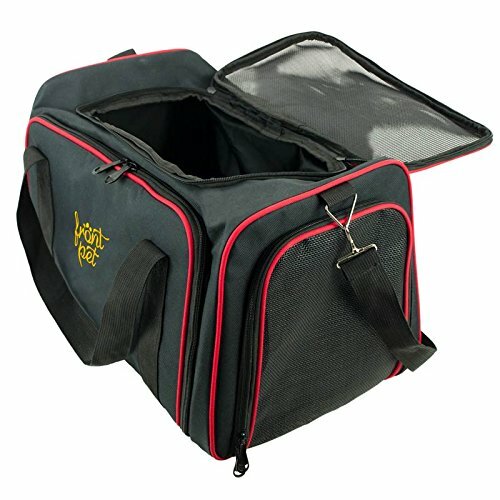 The fleece liner means you will not have to spend the time and money picking out bedding for your carrier. This carrier is pretty much ready to go as soon as you get it. You will have to supply your own food and water dishes though. Both of the available sizes will be able to be restrained using a standard airplane seat belt. Those customers concerned with the appearance will have no shortage of available color options to choose. The security features are nice too. Specifically, the locking zippers prevent your dog from escaping. Finally, the machine washable nylon material makes this an especially easy product to clean. If you go on longer flights, then you will almost certainly have to clean the carrier. 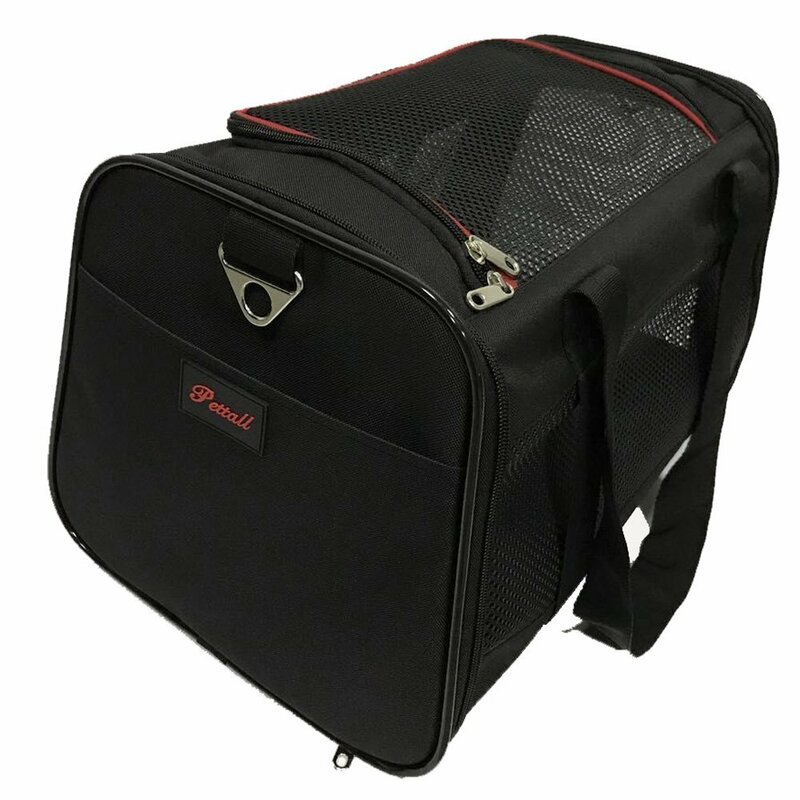 The available customization, straps designed for seat belts, and great security combine to make this a fantastic choice of carrier for your small companion. 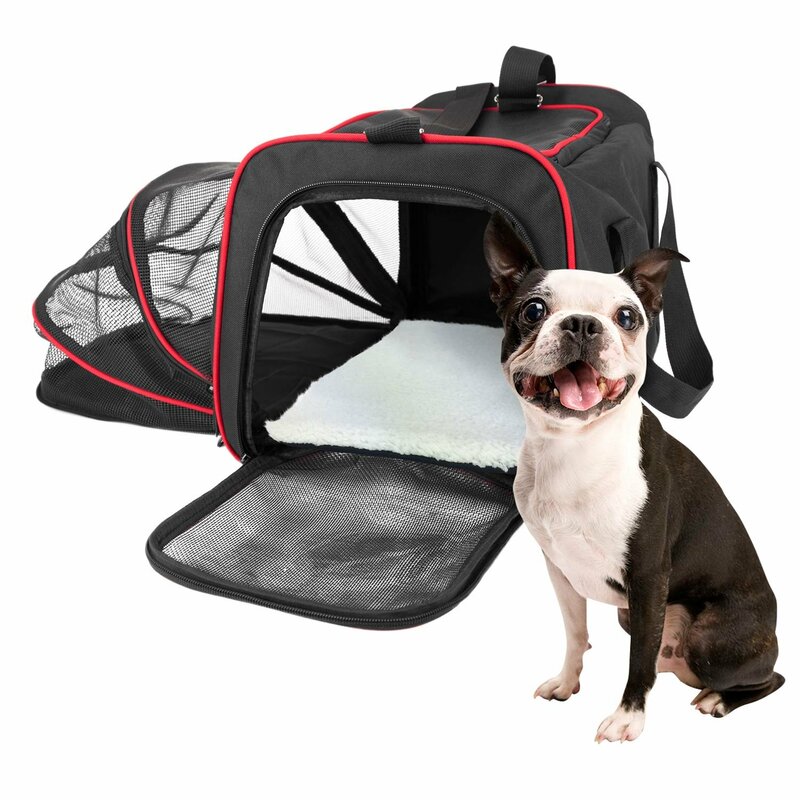 Your dog will be happy, comfortable, and safe in this comfortable soft crate by your side. This carrier was designed to fit under your seat, which means it does not require the use of a seatbelt. It does come in three sizes. You have the choice of either small, medium or large. The carrier doesn’t have pockets on the sides, but it has a convenient zipper. Mesh ventilation on all four sides not only provides adequate airflow, but also easy viewing for your pet. Remember, you will not be able to carry an under seat bag with this carrier. straps to carry this around the airport as well. Most people to find carrying the carrier more convenient than holding it in their hand. 100% machine washable is another plus since your dog will most likely use the bathroom during a long flight. 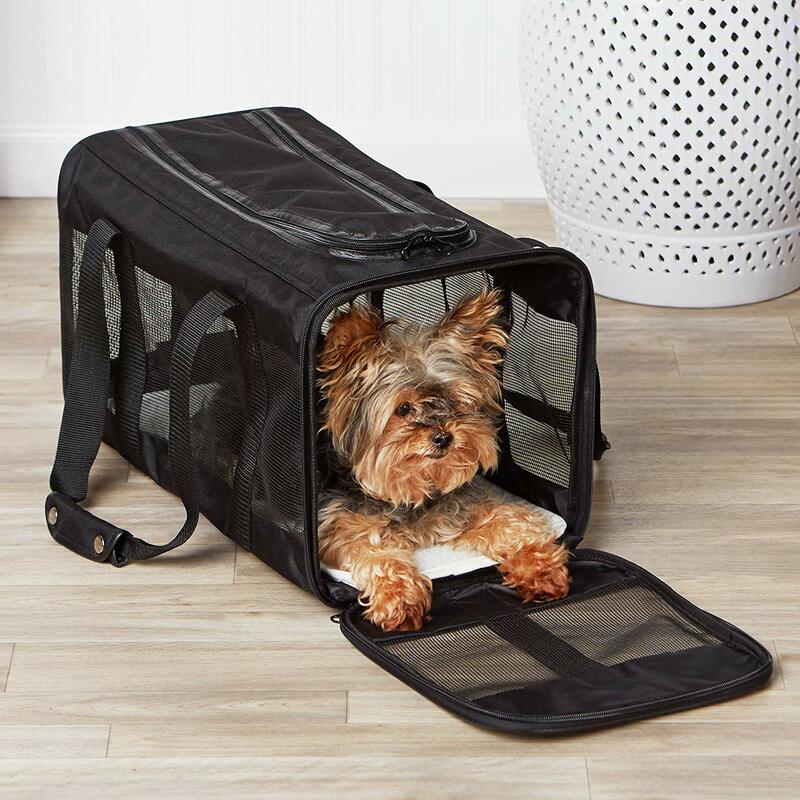 If you want to keep your dog secure and comfortable under your seat, then the AmazonBasics Soft-Sided Pet Travel Carrier. Just keep in mind that only smaller dogs will fit under the seat. This may be the best option on the list. This attractive red and black carrier is quite sturdy. We like that it doesn’t take up much storage room in your house when you’re not traveling due to it being completely collapsible. The three large mesh windows allow your dog to breathe easy as well. This carrier also has a shoulder strap to make thing even easier while in the airport. The sidepockets can conveniently carry small items to keep your pet calm. It offers a little more room than many options, which is a nice feature for any dog. The extra space is particularly useful if you have a larger dog. The main problem with this carrier, and why it’s last on our list, is that it exceeds the size limit for some airlines. Southwest is one major airline that will not allow this carrier. Make sure that it is approved by the specific airline you’re flying with in order to ensure there are no issues. Overall, the Pettall Stable Carrier is great. The ease of use, rigid frame, and convenient features make for a great overall product. However, if you frequently travel on multiple airlines, then it’s best to look into another option for transporting your small dog. For carry-on pet containers, you’ll want to make sure that your new carrier is actually approved by your airline. In most cases, there should be no issue. However, some airlines have different size requirements, which means that you should always check just to be on the safe side. There are a couple of additional features which can also make your life a bit easier. These features include clip-on bowls for food and water. It also includes crates with a built in absorbent bedding. The bedding can save you time and money. Your preparations will mostly consist of keeping your dog calm in order to ensure a stress-free journey for the both of you. The most important thing to consider here is the comfort of your dog. All of these crates would make an excellent choices, so you’ll need to find what works best for you and your dog. 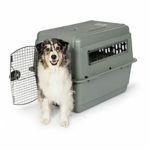 At the end of the day, buying an air-approved crate for your dog is a purchase you’ll be glad you did as you take your pet with you on flights. It can help to make the process much less stressful for both you and your animal. More importantly, it is usually a requirement to have a dog carrier when you fly with your dog. There are more things you’ll need to keep in mind when you take your dog on an airplane, but choosing the right carrier is a huge step in the right direction.